Our Granite Belt strawberry farm at Stanthorpe, in Queensland’s coldest region, is ideally located to grow specialty BerryWorld strawberry varieties during the challenging Australian summer. Like all our BerryWorld varieties, the Stanthorpe crop is also produced under polytunnels – essential protection against potentially extreme conditions experienced in Queensland during summer. The result is vibrant, clean fruit with a natural sheen. Our polytunnels are made of steel frames and covered in UV-filtered plastic to diffuse light. 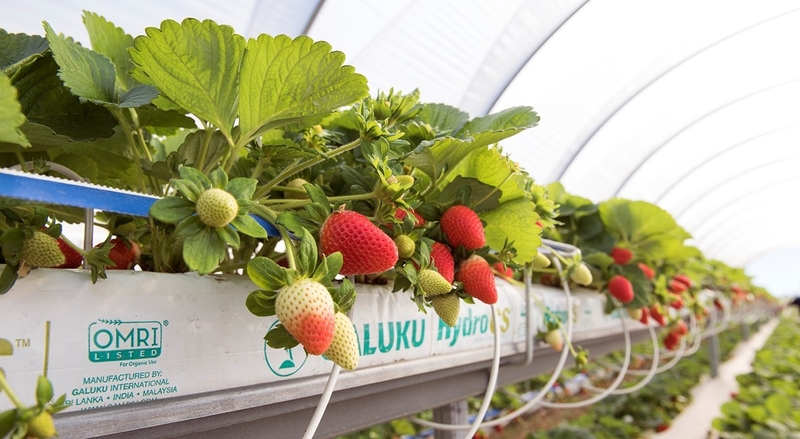 As the inside temperature may be up to five degrees warmer than the outside temperature, sprinklers are installed to cool the crop down as required, as even this cool region can occasionally experience extreme heat. Inside the tunnels, strawberry beds are grown in a tiered system on table tops in rows of four as we trial which method is best for producing fruit with the best flavour, colour and yield. We’re looking at ways to recycle the substrate growing medium which is made of coconut coir. Stanthorpe’s BerryWorld strawberries are produced between September and May.